Fuengirola is a tourist resort located on the Costa del Sol in Spain. Fuengirola dates back as far as the Phoenicians and also played a role in Roman and Arabic civilisations. Today a Moorish Castle still stands in Fuengirola. Fuengirola is also home to more than eight kilometres of beaches. Are you an expat in Fuengirola? What do you like/dislike about it? Let us know in the comments box at the bottom of the page. Fuengirola is located to the south of the tourist resorts of Benalmadena and Torremolinos yet lies to the north of glitzy, ritzy Marbella. There are two airports within a relatively short distance to the resort which are Gibraltar Airport and Malaga Airport. Fuengirola is 20 km west of Malaga along the coast towards Marbella. Fuengirola is very well located – only 20 minutes drive from the major international airport of Malaga with its huge choice of flights to destinations all over Europe. Fuengirola is blessed with a good transport infrastructure and there are numerous bus and train services running daily between the resort and Malaga Airport. You can also hire a car for the duration of your holiday. By car Fuengirola is just off the major roads of N340 or the A7 autoroute. Fuengirola has a regular bus service to and from Malaga airport and also Malaga city centre. 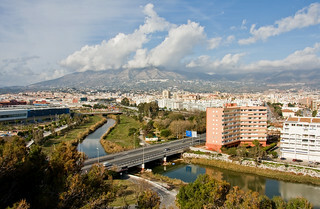 Moreover, Fuengirola has a train service to Malaga city centre. Fuengirola also has a good tourist infrastructure with tons of bars, restaurants, supermarkets, shops, villas, apartments and hotels. Fuengirola is very much a massive, sprawling high-rise tourist resort comparable to mass tourist resorts such as Benidorm on the Costa Blanca and fellow Costa del Sol resorts such as Torremolinos and Benalmadena. There are lots of facilities and amenities here and plenty of nightlife, but for a more traditional taste of Spain head elsewhere! If you wish to see what the Fuengirola market has to offer then you can head for the Los Boliches fairground on a Tuesday or a Saturday while on a Sunday you can browse for antiques at the marina. A few blocks from the resort centre is the Fuengirola Zoo which is one of the most modern in Europe. The Tivoli World amusement park in neighbouring Benalmadena will keep children occupied for many hours as it closes daily in the summer months at two in the morning. To experience a Flamenco Show you can head for the Parque Miramar Shopping and Leisure Centre where every Wednesday evening the Flamenco Azabache gives a free tourist show. The Parque Miramar Shopping and Leisure Centre is one of the largest shopping centres on the Costa del Sol and is home to all the Spanish high street stores such as Zara, Springfield, Massimo Dutti, Mango as well as C&A and H&M. There are also multi-cinema screens, bars, restaurants and free parking for as many as 3500 cars. To see for yourself what Fuengirola has to offer, why not look at a webcam of Fuengirola. Fuengirola has many hotels starting from as little as €10 per person a night. The most recommended hotels include the Florida Spa, THB Reserva del Higueron, Yaramar Hotel, Angela Hotel and Las Rampas. If you are looking for accommodation on a budget then consider staying at a youth hostel. Hostels (also known as hostals) are a very cheap form of accommodation traditionally appealing to backpackers and students although anyone can of course be accommodated. Hostal El Cid is English-owned and is situated in the heart of Fuengirola on the Costa Del Sol, a few minutes walk to the beach. We have 45 spacious rooms over 5 storey’s with a lift to all floors. There are many good restaurants a few minutes walk from the hostel. We are on the main street of Fuengirola, Av Condes De San Isidro S/N, closed to main bus station, closed to Plaza la Constitucion, next to Bershka. Hostal Nevada is located in the center of Los Boliches in Fuengirola. All the services are located near by, included train station, bus stops and plenty of shops. The beautiful beach of los Boliches is just 400 m from the hostel. Hostal Nevada Address: Calle Santa Gema 1, Fuengirola, Spain 29640. Telephone: (+34) 952468305. Another popular way to spend a vacation in Fuengirola is to rent an apartment. Many of the apartment complexes are within easy walking distance to the beaches and the most recommended apartment complexes include the Fuengirola Beach Apartments and the Veramar Apartments. Of course there are also many Fuengirola villas to rent, most of which are located on urbanisations such as campo Mijas and Las Acacias a few minutes away by car from the resort centre and beaches. Here you can expect to rent a 3-bedroom villa with swimming pool and air conditioning for approximately €1000 a week. There are three golf courses within a short drive of the resort centre which are the El Chaparral Golf Club, Club de Golf Mijas and the Torrequebrada Golf Course. As mentioned before, Fuengirola has eight kilometres of beaches and these include the Playa El Ejido-Castillo, Playa Sta Amalia, Playa San Francisco, Playa Los Boliches, Playa Las Gaviotas, Playa Torreblanca and the Playa Carvajal. Being a largely-popular and well-equipped resort, there are well over three hundred restaurants to eat out at in Fuengirola. According to the Trip Advisor, the top ten reviewed Fuengirola restaurants include La Luna, Cala Luna Restaurant, Santorini Restaurant, Moochers’ Jazz Café, Restaurant Barolo, El Rio, Zena, Oyster Bar, Mira India, and the Triffula Restaurant Pizzeria. Fuengirola bars recommended by holidaymakers include Coasters Bar, Lolas Bar, Jacksons Bar, London Pub Fuengirola, Bar La Paz Garrido, Bodega El Toston and the Smile Bar. Fuengirola is known for its nightlife with the most popular hotspots named as the Discoteca Mai Tai, the London Underground, Bogart Café, Mahama, the Coyote Fuengirola, Rambo Ocio and the El Templo Copas Bar Fuengirola. The neighbouring resort of Benalmadena is also worthy of a visit for the nightlife enthusiast – see our reviews of Benalmadena nightclubs & bars. If you don’t like the pulse of a small city, but prefer the countryside, you might find Fuengirola a bit too busy. It’s approximately 50% Spanish and 50% foreigners. I enjoy having a nice meal with my wife in the different types of restaurants that Fuengirola can offer. I also enjoy going to the beach and playing football with my friends at one of the local sports centres. Yes, of course! You can find a wide selection of different types of services and in your own language! Mijas, 10-15 minutes’ drive, is a traditional Andalusian village with white-wash little houses and narrow streets. Fuengirola has Swedish and Finnish schools and a British College can be found in nearby Torremuelle, only 10 minutes by car. The Norwegian school is in nearby Arroyo de la Miel, also about 10 minutes by car. Like in every town, there is crime, but it is not something you notice on a day-to-day basis. Fuengirola has always been a very attractive place to live, but since the property prices have only recently started turning upwards, now is a great time to buy. Opportunities can always be found even though Bank repossessions are not very common. Puebla Lucia is a quiet and peaceful oasis in the heart of Fuengirola. This is a fenced off area with large swimming pools and tropical gardens, but most of all, it is calm and relaxing right in the middle of town! Puebla Lucia was built in the 1980s and is considered the most attractive area of Fuengirola. Puebla Lucia has received several architectural awards for its authentic Spanish building style. Los Boliches is a district of Fuengirola, situated in the eastern parts of town. Like the town centre, Los Boliches is an urban area with mostly apartment blocks and a few rows of townhouses. In the blocks closest to the sea, you have the busiest parts and this is also where you have most of the bars, restaurants and shops. You also have several supermarkets and a smaller version of the Corte Inglés department store, all this within walking distance! A few streets up from the beach you have a smaller area of townhouses, which are very attractive due to their central location. Los Boliches has its own train station, so it is easy to go to the airport or further on to Málaga. Torreblanca is a district of Fuengirola, with Los Boliches and Los Pacos as its closest neighbours in the municipality. It is a quiet area, but at the same time near the city pulse of Fuengirola and the wonderful seafront Paseo Maritimo. Most of the properties here are villas and townhouses, but you can also find a few apartment blocks. Torreblanca has its own train station and several bus stops, or if you prefer to go by car, Fuengirola is only 2 minutes away. The Malaga airport is roughly 20 minutes away by car. How much are the typical property prices in Fuengirola for apartments, villas etc? It depends a lot on situation, views, distance to beach etc, but a 2-bedroom, 2-bathroom apartment is usually priced between 180,000 and 240,000 euros. A 3-bedroom townhouse is usually priced between 250,000 and 350,000 euros and a villa from 400,000 euros and up. Any tips and advice to people looking to buy in Fuengirola or surrounding area? Since the real estate business is different in Spain to many other countries and agents are in most cases members of collaboration networks, choose one agent that you feel comfortable working with and has good knowledge and experience in the area you are looking to buy a property in and stick to that agent. That agent will then look for a property not just in its own listings but also collaborating agents’ listings and help you through the whole sales process. Of course, we hope that we at Alamo Costa del Sol Real Estate can be your choice of agent! Daniel, thank you so much for taking the time to help our readers with your experiences in Spain. If you want to contact him, you can find his details below. Here is an interesting tourist video on Fuengirola. We have lived in fuengirola 3 times in the last 18years. The Spanish people are very friendly and helped us to settle into our rented apartments each time we relocated. Our English friends were there to support us whenever something cropped up that was challenging. We also made friends with lots of other people from different cultures in the many bars and restaurants along the paseo. The area has its own eco climate and with lots of things to do and see for all age groups. We still holiday there as and when possible although we are now living back in Manchester England. We will always have half our hearts firmly in Fuengirola . Fantastic place to live and for holidays. I am a South African, looking at relocating to Malaga, Spain in 2016 as my partner is a Doctor and has landed a great opportunity there. He has an EU passport but I don’t. I am a qualified Public Relations Officer and Personal Trainer. I currently run the social media, communications and employee management department at M&D Health (multi- disciplinary medical and wellness brand). I am also a personal trainer. I have a vast amount of experience and knowledge in dealing with people (whether it be waitressing, au airing, personal training, receptionist duty, public relations, people management skills and event co-ordinating). We are coming to Spain in the beginning of next year but I would like to find out what opportunities there are for me beforehand so I can make contact with the relevant people (employees) and maybe even secure a job before I relocate permanently. I would love to do something in my field of expertise but I am also open to whatever opportunities get thrown my way. I am a friendly, positive, extroverted individual with a passion for health, wellness, peoples satisfaction and hard work. My home language is English but I am in the process of learning Spanish which I am picking up quite quickly. Any information you can provide me with would be much appreciated.